Merry Christmas to all! I know exactly what you should ask for next Christmas – a pet reindeer! There are three reasons why a reindeer would be a great pet. Reindeer lose their antlers every year and grow them back. This means each year you have your pet reindeer, you’ll have another set of antlers to hang in your den. Couple this with that facts that reindeer have the largest antlers to body size ratio of any deer and both males plus females have antlers, and you have a hell of a pet. 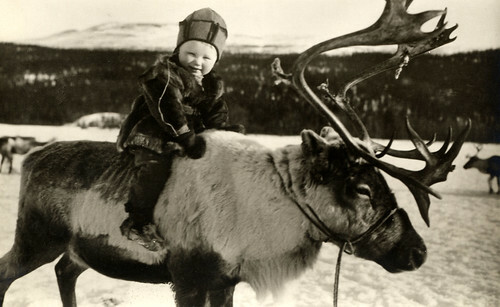 Pretty much all we drink is cow milk, and maybe occasionally some goat milk, but there are many other animals that product excellent milk, including reindeer. Compared to cow milk, reindeer milk has 3 times the protein, 6 times the fat, and half the lactose. Sounds pretty good, but be warned – it is pretty labor intensive as it requires someone to hold the antlers while someone else milks. Probably worth the effort though. How legit would it be to have a live reindeer to go along with your Santa costume? 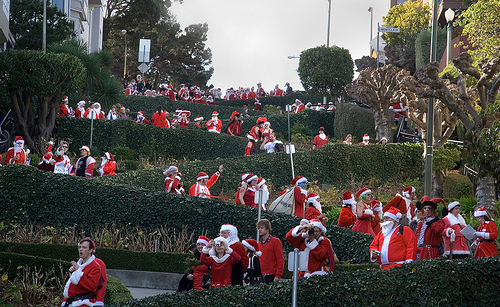 Can you imagine a reindeer pulling you down Lombard Street at SantaCon next year? See if you can get your hands on some wallaby milk in NZ… I remember hearing that it’s a superfood or something.